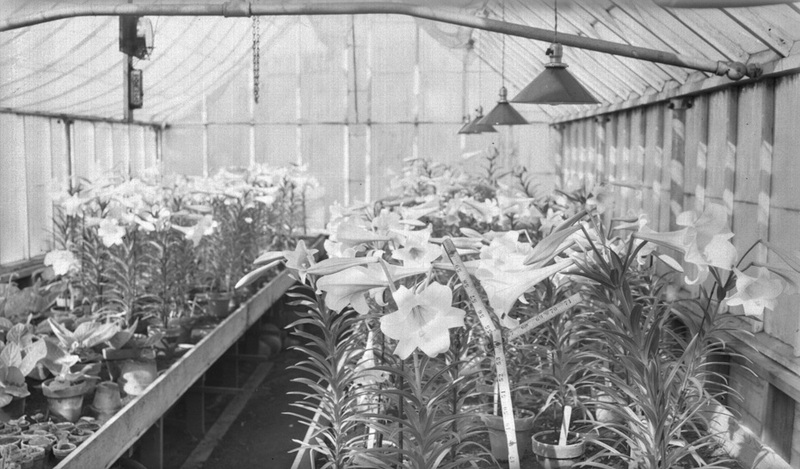 This April 1941 Alva Day image shows a greenhouse growing flowers, I'm guessing Easter lilies. I'm sure someone will correct me if I'm wrong. Yes, they are Easter Lilies. I would imagine this is at the green house/florist shop of the Calmette's on Hull Street. Thanks Nellie. That would make this image about a block away from yesterday's image. Is the ruler for measuring blossom size? if the greenhouse had just been set up with an automatic electrical system for light and perhaps watering? I suspect the presence of grow lights was enough to attract Alva Day's camera. Use electric grow lights to get the biggest Easter lilies in town. I think that was probably the only place in Hood River where Easter Lilies were actually grown. Possibly Calkins had some, but rather doubt it.